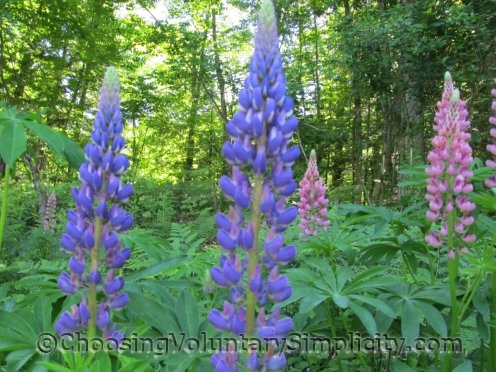 I love the way these lupines (Lupinus polyphyllus) are growing wild at the edge of one of our wooded areas. They’re mostly shades of rose and lavender, with some deep purples and blues mixed in. 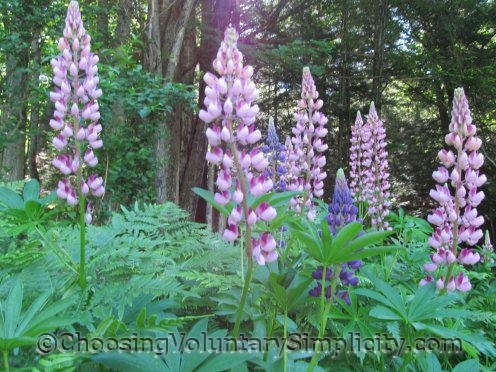 Lupines grow best in average soil because they actually add nitrogen to the soil they grow in, and too much nitrogen in the soil will grow foliage but few flowers. Lupines like plenty of moisture but good drainage is extremely important to them. They can grow in either full sun or light shade, but their flowers will be larger and more vibrantly colored if they are grown in a sunny area. Our lupines are tall… most of the flower stalks are more than five feet… and through their natural reseeding have formed large clusters of plants. Transplanting lupines can be difficult because they have an extremely long and delicate tap root that is easily damaged. However, when lupines MUST be moved, I have found that I can move them successfully early in the spring while the plants (and tap roots) are still very small. Lupine seeds can be planted in spring or fall. Supposedly seeds will germinate more quickly if the surface of the seed is scratched or chipped and the seed is soaked overnight in lukewarm water, but I have never found this to be necessary. Lupine seeds need to experience a cold period, either naturally in a cold climate by planting the seeds outside in the fall… or artificially by putting the seeds (in a damp paper towel in a plastic bag) in the refrigerator for seven days. 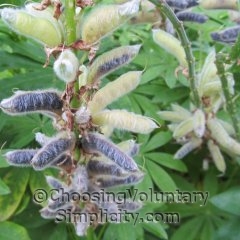 Lupines produce such an abundance of seed pods, it is always easy to grow more and more plants. Left alone, the seed pods will open, the seeds will fall to the ground, and more plants will grow. 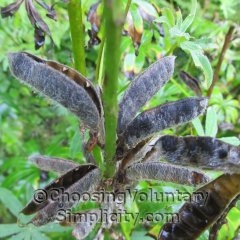 I usually let the lupines reseed naturally, but lupine seed pods will literally explode and release the seeds when the seeds are ripe, so when I do want to collect seed, I pick the pods before they are completely dry and store them in a large white envelope. This year I gathered quite a number of pods because I want to start a new patch of lupines in another location… using a combination of saved and purchased seeds. 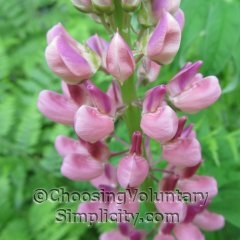 Hopefully next year we will have yellow and white lupines mixed in with all the pinks, purples, and blues. Love the dark blue ones especially. They’re all beautiful though. I just got some seeds and hopefully will have lupines another year. I didn’t know that about lupines doing better in average soil. I planted some in rich soil and even added fertilizer. Duh! I got tons of foliage and practically no flowers and didn’t know why. I thought the plants were bad so I went back to the garden center and talked to the man I bought them from. He didn’t know either but I think you have solved this mystery. I will try again without all the enrichments. I’ll let you know how it turns out. My sister has a garden of lupines. She doesn’t do anything to them and they are so beautiful. I on the other hand have given lupines special treatment and almost no success with flowering. I have never known why. I can verify the information you gave about not transplanting big lupine plants. 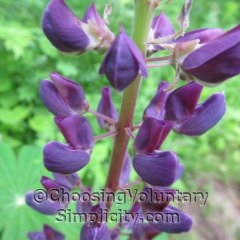 I tried for years to transplant lupines and they always either died or were stunted. I did not know that if the taproot was damaged the plant will die. When I started moving lupines only when they were very small in early spring I started to have plants that would flower. Nice article and photos. Love this blog.